The trend of smart phones consuming maximum number of semiconductor ICs by revenue continued in year 2014. 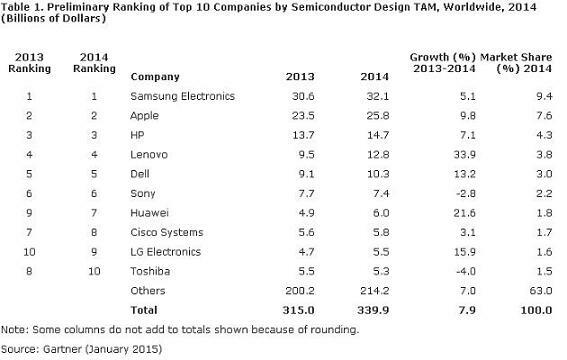 The leaders in smart phones Apple and Samsung remained top consumers of semiconductor chips in the 2014. Samsung Electronics and Apple remained the top semiconductor buyers in 2014, representing with a combined semiconductor demand of 17 percent, according to Gartner, Inc. Samsung Electronics and Apple together consumed $57.9 billion of semiconductors in 2014, an increase of $3.9 billion from 2013 (see Table 1). "Samsung Electronics and Apple have topped the semiconductor consumption table for four consecutive years and their decisions have considerable technology and pricing implications for the whole semiconductor industry," said Masatsune Yamaji, principal research analyst at Gartner. "However, while Samsung Electronics kept its position as the No. 1 largest customer of semiconductor chip vendors, its growth rate in 2014 was lower than the global semiconductor market's growth, firstly because it struggled in the smartphone market, and secondly because it is withdrawing from some parts of the PC market." The top 10 companies bought $125.6 billion of semiconductors, to account for 37 percent of semiconductor chip vendors' worldwide revenue in 2014. This was up from $114.8 billion, accounting for 36.4 percent in 2013. The top 10 outperformed the semiconductor buying market and grew by 9.4 percent overall. As a result of the stabilization of memory prices from 2013, eight companies among the top 10 increased their semiconductor demand in 2014. All of the top 10 companies in the design total available market (TAM) ranking for 2013 remained in the top 10 in 2014, although a number exchanged places. Through mergers and acquisitions, fourth-place Lenovo significantly increased its semiconductor demand in 2014 with growth of 33.9 percent. With growth of 21.6 percent, Huawei climbed to No. 7 in 2014, up from No. 9 in 2013, while LG Electronics climbed to No. 9 in 2014, up from No. 10 in 2013, with growth of 15.9 percent. "The competitive landscape of the electronic equipment manufacturers and the semiconductor demand map were stable in 2014, but the slowdown in Samsung Electronics' design TAM can be considered a big trend change," said Mr. Yamaji. "Samsung Electronics and Apple remained the top two, but their combined growth underperformed the total semiconductor market growth in 2014. The impact from these two giants is still huge, but it is becoming weaker while Chinese electronic equipment manufacturers, such as Lenovo and Huawei, significantly increased their importance as semiconductor chip buyers in 2014." The cycle of an inflated boom and the obsolescence of electronic equipment are becoming faster, and it is also much more difficult for leading companies to maintain their position for a long time. "It is inevitable that price competition between smartphone and media tablet vendors will become fiercer in the coming years, as hardware differentiation has been difficult to achieve. The pace of commoditization is accelerating, which leads to Chinese electronic equipment manufacturers growing fast," said Mr. Yamaji.